Back in 2000, Sydney hosted the Summer Olympics. As enjoyable as they were, the best thing about having the Olympics was the comedy television we had on in Australia at the time. Before the games we had The Games, a “mockumentary” by John Clarke, Bryan Dawe and Gina Riley about the Sydney Organising Committee. During the event we were lucky to have The Dream with Roy and HG on every night. Both were top quality. Brilliant and hilarious and unmissable. However the best thing about The Olympics was this. 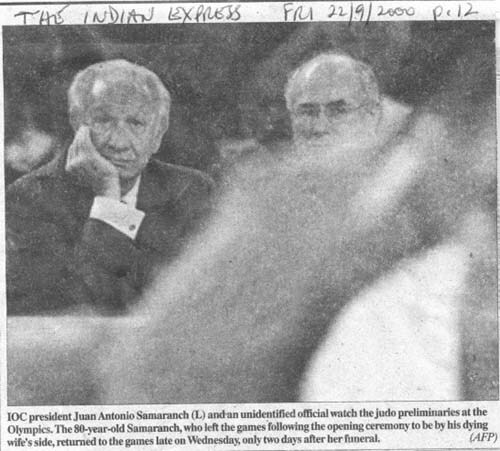 This appeared in The Indian Express on the 22nd of September 2000. It makes me proud to be an Australian. This entry was posted on Monday, September 13th, 2010 at 9:10 pm	and is filed under Life. You can follow any responses to this entry through the RSS 2.0 feed. You can leave a response, or trackback from your own site.